On 14 of September 2015, BICC held a one-day workshop on Public Information (PI) about small arms (SALW) control and disarmament, demobilization and reintegration (DDR) in Darfur. 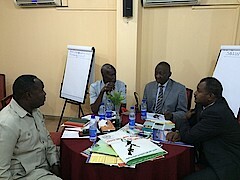 The workshop was organized in collaboration with the Sudan DDR Commission (SDDRC) and took place in Khartoum, Sudan. The objective of the workshop was to update PI messages on SALW control and DDR to the current situation, and to develop new PI messages on arms registration and marking and community security/stabilisation. The workshop was attended by 16 participants of the SDDRC, UNDP, UNAMID and NGO Maman, in particularly the PI officers of these organisations. After a plenary introduction by Mr Salah Idris, the SDDRC’s SALW control focal point, the participants were divided into groups to work on the specific themes. The outcome of the workshop were new sets of PI messages in Arabic tailored for the community level in Darfur addressing topics such as safe weapon storage, responsible weapon owning, and the importance of arms registration and marking. These messages will be used for PI material such as brochures, hats and T-Shirts. BICC has been supporting arms control activities in Sudan, in particular, in Darfur since 2012 on behalf of the German Federal Foreign Office. The center currently deploys a full-time international technical advisor as well as a consultant to the SDDRC.